Roasted Red Pepper, Carrot and Hummus Sandwich. 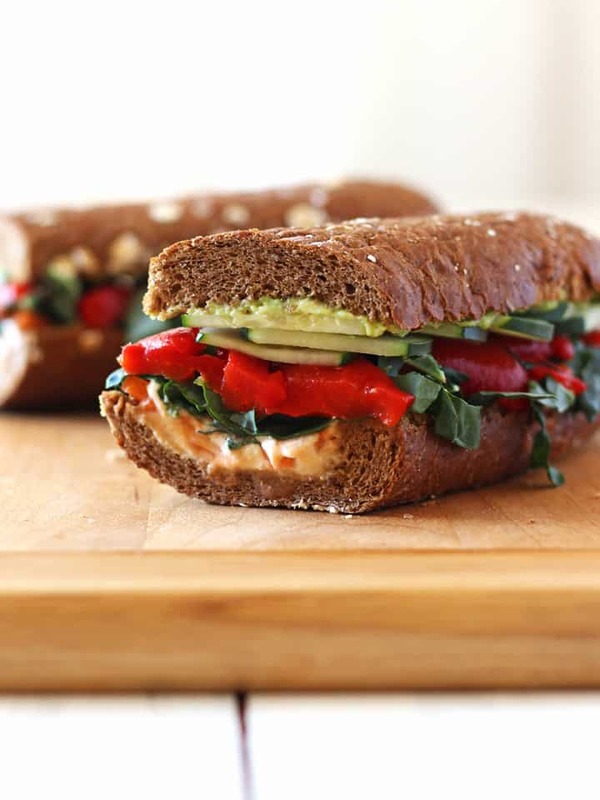 A toasted whole wheat baguette layered with hummus, avocado, roasted red peppers, matchstick carrots and generously topped with fresh veggies. 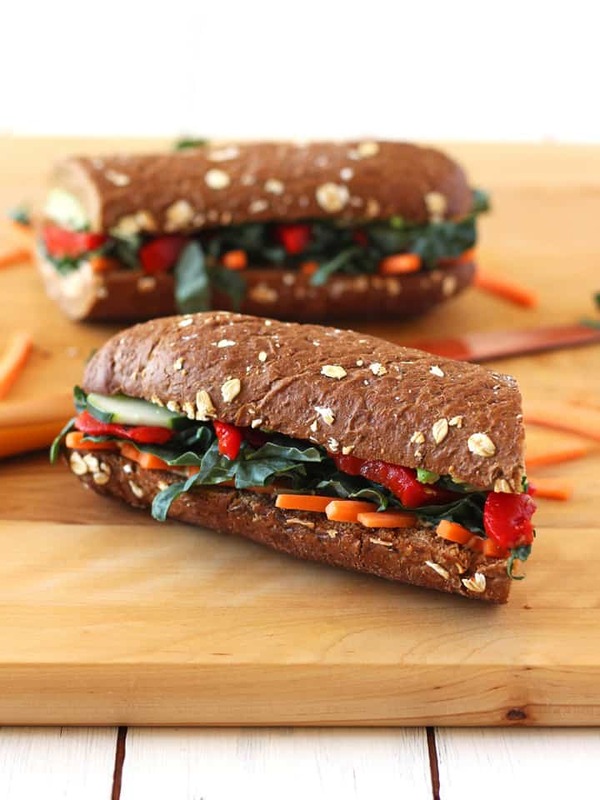 Cure lunch sack depression with this quick to prepare, high fiber and veggie packed Roasted Red Pepper, Carrot and Hummus Sandwich. The origin of this tasty recipe begins with my first real job, which I can’t believe was almost 20 years ago. Do you remember your first job…was it scooping ice cream, folding sweaters at The Gap or were you forced to dress up as Chuck E. Cheese like my poor friend Brian? Oh, please share in the comments I love hearing first job stories. When I was 16, after a brief seasonal stint at a theme park I started my first “real” job working part-time for a small chain sandwich shop. It was fun learning how to make pineapple boats and cabbage dip bowls for catering orders but the best perk was the employee discount. The menu had thirty different kinds of sandwiches and my favorite was the Hummus, Carrot and Red Pepper. A toasted whole wheat baguette layered with hummus, provolone slices, roasted red peppers, matchstick carrots and generously topped with fresh veggies. Sounds common now but in the mid 90’s it was a unique combo. Not one to let a good thing go I’ve been keeping the sandwich alive creating different versions of it over the years. Sometimes I switch the cheese for a heart healthy dose of avocado and the lettuce for vitamin rich kale. Nope, I never change those. With recipes like Sriracha Vinaigrette, Spicy Chickpea Edamame Salad Pitas and Cheddar Sriracha Cornbread Donuts it’s no surprise sriracha would make its way onto this sandwich too. Until our Vegucation I never enjoyed spicy food. After quitting diet soda and artificial sweeteners something happened. My taste buds changed. With or without a tiny helping of hot sauce this Roasted Red Pepper, Carrot and Hummus Sandwich will delight your taste buds, refuel your body and happily fill your belly. The recipe makes enough for two, so go ahead and share. That way you and a co-worker can both enjoy a Not Sad Desk Lunch. 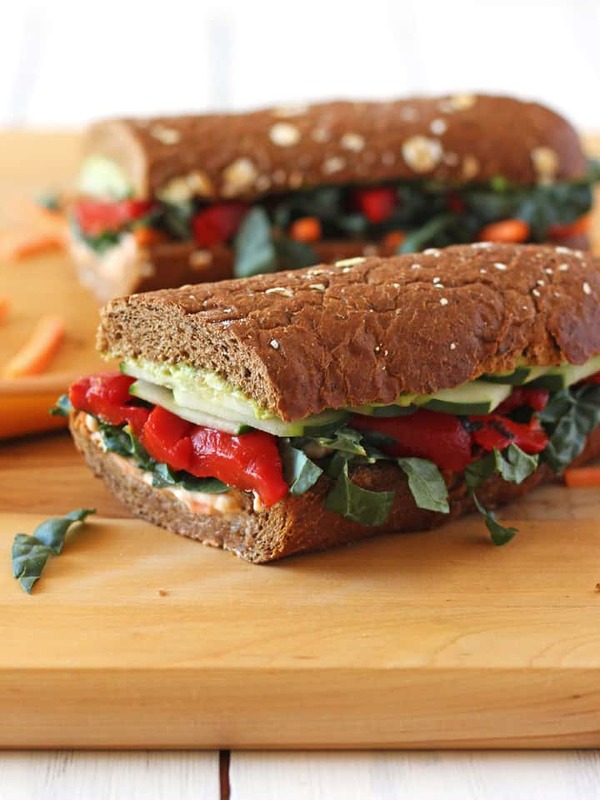 A not sad desk lunch bursting with flavor from sweet fire-roasted red peppers, creamy avocado, nutty hummus, bitter kale and crunchy veggies on a crusty loaf of whole grain bread. Slice the baguette in half lengthwise and scoop out bread from bottom half making sure to leave at least a 1/4 inch border of crust and bread. Drizzle both sides with olive oil and toast until lightly crispy. 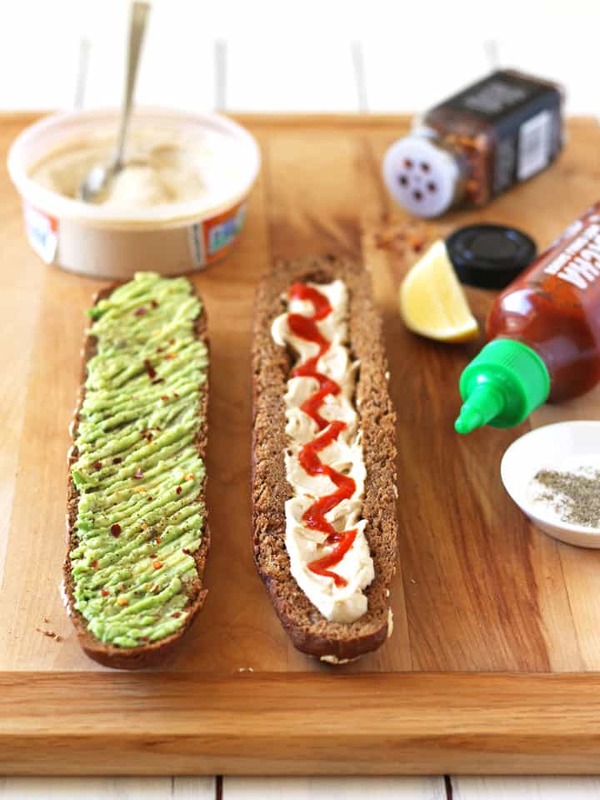 Mash the avocado onto the top half of the loaf. Squeeze the lemon wedge over avocado and sprinkle with salt, pepper and red chili pepper flakes. Spoon hummus into the bottom half of the loaf, spreading it into an even layer. 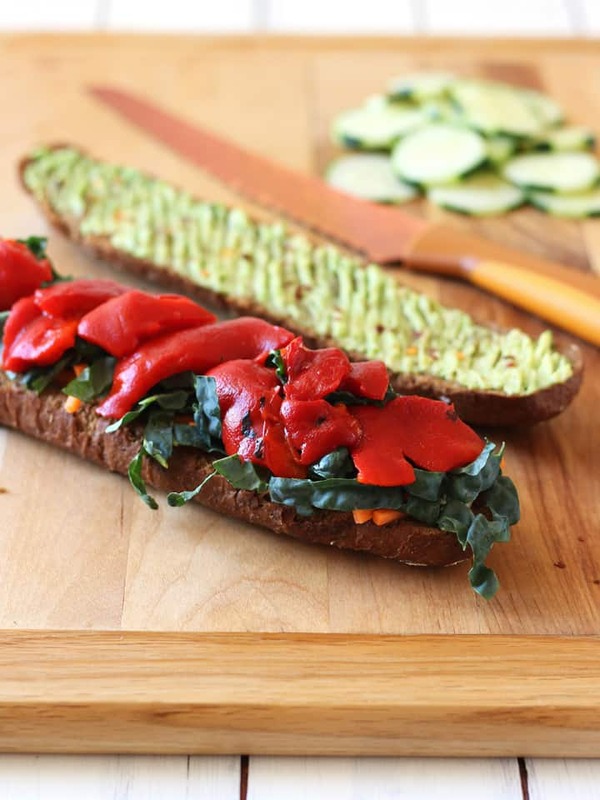 Squeeze sriracha sauce over hummus and layer with carrots, kale, red peppers and cucumbers. Cover with top of loaf, slice in half and enjoy. Nutritional Information is an estimate for 1/2 of the sandwich. This recipe was submitted to Meat Free Mondays at the yummy vegetarian blog Tinned Tomatoes – check it out every Monday to easily plan a delicious meat free week! My first job: the summer I was 15 I worked in a refrigerated warehouse packing cherries. Cold in the warehouse, standing the whole day at the assembly line, then get on my bike and pedal 3 miles home in the heat. All for minimum wage…taught me the value of getting an education, LOL! This looks delicious! I love crunchy veg and hummus in a sandwich 🙂 My first job was working with food too – I worked Sunday lunchtimes in a restaurant prepping their desserts! Thanks Anna 🙂 I hear you, I hate buying lunch if I can bring it. I think the avocado and veggies would be fine but the hummus might make things a little soggy. 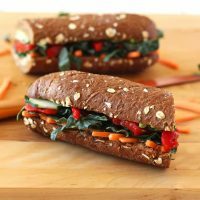 If I was packing it to eat on the go I would put the kale and carrots in the bottom first to act as a barrier between the hummus and bread. Or I might leave the hummus on the side to add right before eating if it would work for the situation.